LifeVac is a fairly new device invented to help prevent choking deaths. Particularly helpful when abdominal thrusts (or Heimlich Maneuver) not effective. 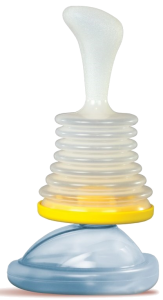 LifeVac uses suction at the airway, rather than upward pressure at the diaphragm, to dislodge foreign bodies in the airway.